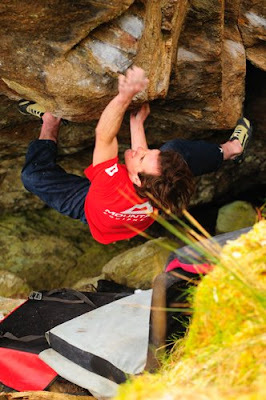 For bouldering in Scotland, 2008 will be a pivotal year. The pace of development of Scottish bouldering and discovery of new areas has accelerated more and more over the past ten years. 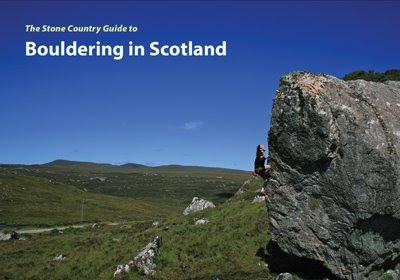 Now, anywhere you live in Scotland, there is documented bouldering not far away from you. That’s fine if you are the ‘new routing type’ who doesn’t mind trawling the net to keep up with new developments and search out printable topos. But the bulk of climbers still want to just buy the book and get out on the crags in their precious spare time. 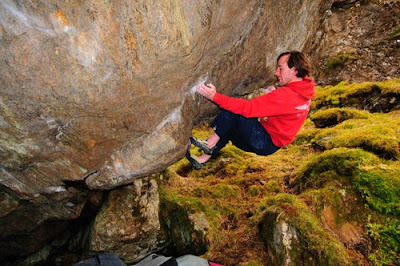 John Watson took the bull by the horns, left his job and jumped in his car for the best part of two years travelling repeatedly around the glens to make the first Scottish bouldering guide a reality. And here it is, in my lap! Wow! Bouldering in Scotland details in full, inspiring colour 60 of the best bouldering venues with superb photos, topos and and a straightforward layout. The standard and payout of the guide is reminiscent of the recent Peak bouldering guide. Really, all there is to say about the standard of production of the book is that it competes with anything that is out there, and you’ll find it a pleasure and an inspiration to use. The interesting thing to talk about is the content. 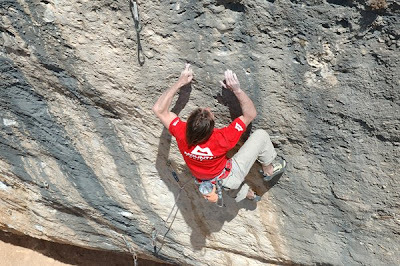 John has opted for the selected approach for describing problems, which in many people’s opinion is the best way to go for many rock types in the sport of bouldering. In the 60 areas covered in the book, there are many problems not described. But here’s the problem – if you are a local, you know all the eliminates anyway. If you are a visitor, you just want to find the best pure lines. 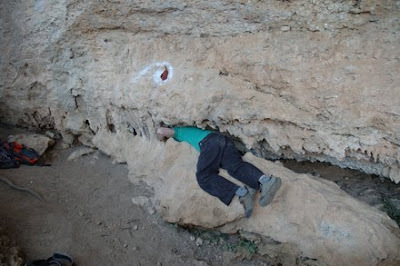 The nature of bouldering means a lot of climbs get squeezed into a small area. Over describing the climbing at a venue takes away from the classic lines. 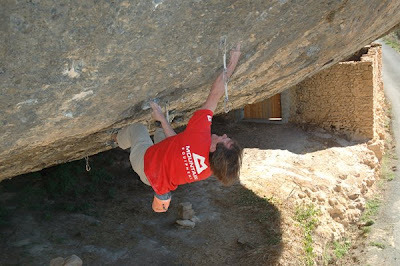 Bouldering, still young, seems to be still moving in a direction where it’s considered better to work on the best lines and overcome their barriers of difficulty, rather than potter on a thousand eliminates at the same level and never progress. So the book shows you the best bouldering lines that have been found in Scotland to date. For sure this edition is the first in what will no doubt be a series. It’s as essential a part of Scottish bouldering kit as the mat, midgy spray and beanie. In the next one I’d love to see photographic contributions from a wider range of photographers. For instance, many a stunning shot resides in Cubby’s spare room that should be inspiring climbers in this book. But hopefully this edition will be a platform for John to keep celebrating Scottish bouldering in print. Us climbers owe you one John, thanks for this book! If you want a copy, you can get it from my webshop. Posted straight to you and remember I’m giving away my ‘How to Climb Hard Trad’ E-book with purchases from my shop. So you are getting more for your cash than if you waste a potential bouldering session walking to the shops to get it! 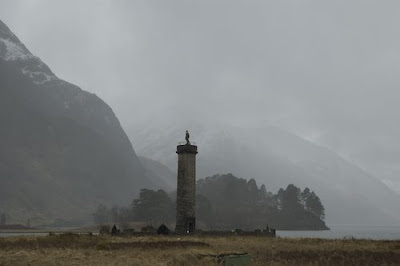 The pictures below give a week in the life, of life in the best place to live on earth (that I know of) - Lochaber. Time is super tight right now so I have little time to write on my blog for the time being. 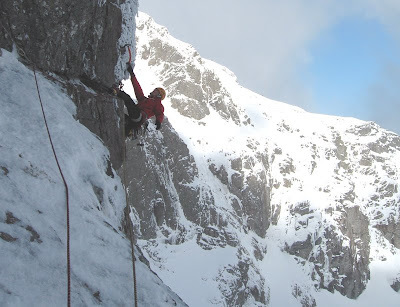 Conditions at this time of year are perfect for every type of climbing so life becomes extremely frantic in the Scottish spring, especially when you have to attempt to fit in the normal 60 hours a week in front of the work screen by night as well. First ascent of the Bear Trap Prow V10, Skeleton Boulder, Glen Nevis. Thanks to Cubby Images for this and the pic below. Intrepid filmmaker #2, Dave Brown, after filming me on the Hurting. Malcolm Kent standing at the foot of a project, Ben Nevis. It didn't go this time. 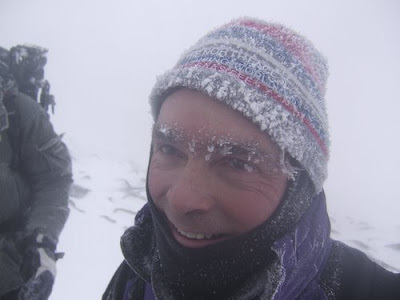 Trying to smile through pain of blood returning to frostnipped fingers and toes, Ben Nevis. 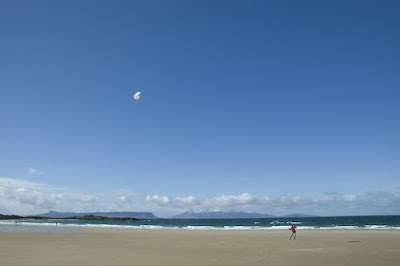 Claire carves a turn with the kite, Arisaig. 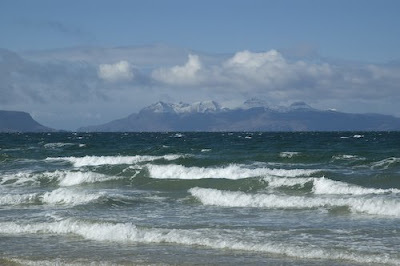 Isles of Eigg and Rhum behind. 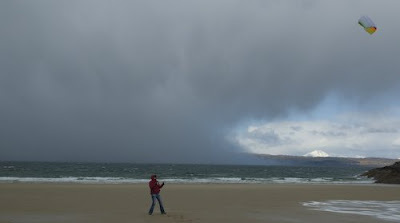 A snowstorm sneaks up on Claire across the Minch. Actually, the howling bitter gale ahead of it somewhat gave it away. 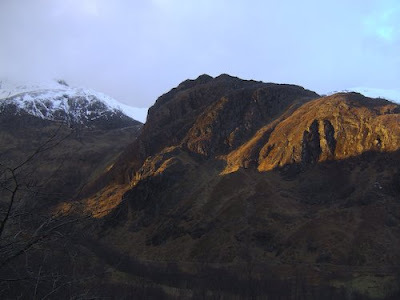 Late evening light at Steall hut crag, Ben Nevis behind. Beginning the crux section of Don’t Die of Ignorance XI,11. Photos: thanks to and copyright Lee Morris. Click on them for a larger image. 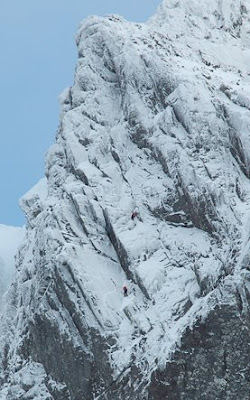 Many thanks to Nick Harvey and Lee Morris who sent me these shots of Don’t Die taken as they passed below in the Coire. It's quite amazing to think that in all the rock visible in this picture, there are only routes (Don't Die, and Anubis E8, the big prow on the right). 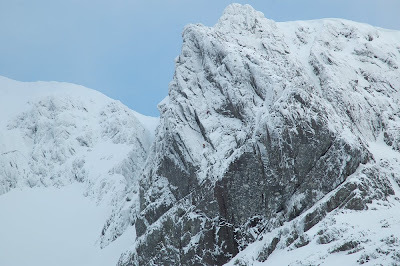 Sunday was an amazing and memorable day on Ben Nevis with Joe French, John Sutherland and Claire. On Saturday afternoon I had that gut feeling that Sunday was ‘the day’ that I would have the best possible chance to finally free climb Don’t Die of Ignorance. The weather was doing all the right things (slight thaw with a fine but cold day forecast ahead), I was rested and the challenges of the route were fresh in my mind from Friday’s battles on it with Donald. I called everyone, but noone could climb with me. Rope solo? Maybe. On a last ditch I texted Joe who by chance had a free day and came bouncing round to the house overflowing with enthusiasm at the prospect of a major adventure and the chance to get some awesome footage. Little did he know what he was letting himself in for. At 6am the next morning we began our familiar pilgrimage into the north face. By 10am I was back once again, staring at that grim undercut crack disappearing round the prow into no man’s land. Just like Friday I desperately struggled to seat my axe in the crux tin opener. I screamed to Joe to expect a fall and released my left axe, cutting loose onto one arm. The axe slid and jerked a centimetre. My heart missed a beat and the jolt nearly made me fall, my hand sliding down the upside down axe to the head and rolling onto three fingers. I dynamic match and kung fu allowed one foot to swing onto the wall to the right and up to the peg I got in on Friday. The vertical wall above was climbed in an utterly ‘go for broke’ style, axes ripping , dropping onto one hand and gasping with pump and shrieking for slack. All a bit full on. But finally, I made it into those upper grooves! Some VII led to a belay and I took in the ropes. It was Joe’s turn to have a gripper. The plan was for Joe to aid as far as he could into the crux and then jumar one rope to the belay. 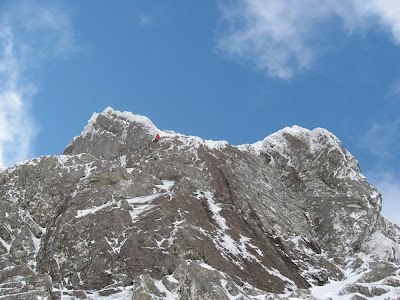 At the start of the traverse he hooked a cam on the lip of the roof but cut loose violently onto it, his wrist loop tightening leaving him completely stuffed – about to lose a hand and unable to do anything about it. On the belay, I could do nothing (too much stretch in the rope) but listen to him screaming in pain and fear. Quick thinking and one handed application of the jumar meant he could at least free the hand and drop into space. Totally gripped up, Joe struggled for nearly two hours to right himself, sort out the rope mess and jug to the belay. By the time he arrived, I was in a bit of a state myself. I had to half my rack and drop two clothing layers to lose enough weight to get me through the crux pitch. I knew it would mean suffering at the belay. 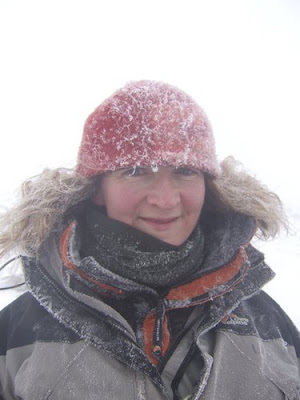 But after three hours I was worried that I’d gone through feeling aweful and despite shivering uncontrollably, I no longer felt cold. The worst thing was seeing Joe’s face when he looked at me! “Dave, mate, your lips are blue!” Joe rubbed my legs furiously as I sorted the ropes and got motoring, We had a lot of climbing still to do in the short time before dark. But first I had to abseil back down the crux pitch to retrieve all the gear that Joe couldn’t get (he had to untie from the rope that had all the runners on because it went way off to one side and he was unable to swing to it). After another big amazing pitch of neve grooves, the pace got faster still and the next two pitches of V or VI mixed were led with continuous movement and one runner to back up the belay. In the last of the dim evening light I popped out onto the broad shelf at the very apex of the pyramidal Comb Buttress. I dreamed of topping out here – it was amazing. 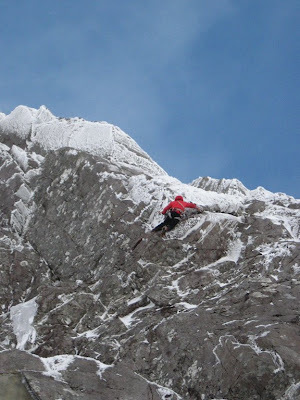 But I worried about Joe seconding up. Then something brilliant happened. The clouds opened above me and a bright moon lit up the whole corrie and instantly made the final two pitches a foregone conclusion. What a moment! All that was left was to whoop our way up the neve encrusted crest of the Comb to the plateau taking in the unbelievable beauty of the moon, stars and gently lit white cliffs. Is it possible to have a more satisfying or exhilarating top out on a climb? Last night we sat in Joe’s and watched the footage. I laughed at my footless sketching on the crux, but all of us sat up in silence watching the image of Joe dangling by one axe screaming and legs waving in the middle of a huge icy face. It had quite an impact and I must say It was an incredible effort from Joe to regain his composure so well to deal with the upper pitches. I was also in awe of Claire who was there, a tiny dot on the corrie floor filming in the cold for 7 hours. She told me later that she almost had to leave because she could bare to watch the situation as Joe hung in space and we screamed at each other trying to communicate. I feel strange having climbed it because although it was me who actually climbed the moves, the task was only possible because of several people who were up for holding the ropes and the prospect of having to try and second a complex and desperate piece of climbing with total commitment. Anyway, I’m sure I’ll write a bit more about this elsewhere because we had such a big adventure. 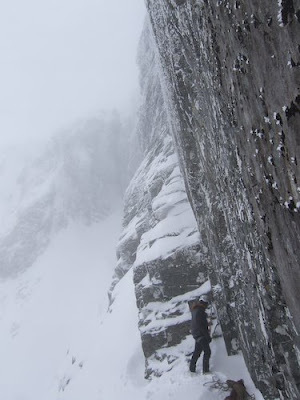 But right now I have to go out and make the most of the awesome conditions in Lochaber for bouldering, sport climbing, trad climbing and winter mountaineering. Dry, sunny, 9 degrees at sea level every day, and new routes to do everywhere. I’m glad I moved to Fort William!!!!!!!!! 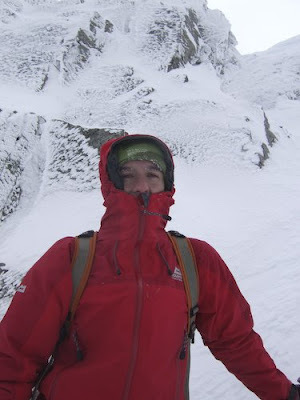 Claire described her view of Joe's struggle and her experience of filming the climb on her blog. 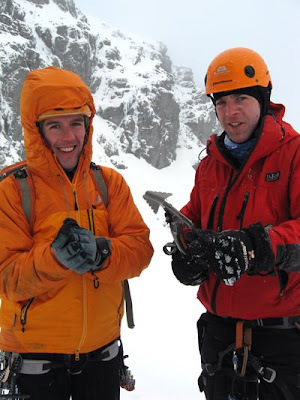 Some more 'eye witness' and a cool photo of Joe hanging in space on Highland Guides blog. A free ascent based on the 1987 aid route by Andy Cave and Simon Yates, taking a more direct line at the crux. Climbed ground up, onsight, 6th attempt. Start on the left side of the Comb at the start of the huge diagonal shelf/crack system. 1. 30m Follow the easy snow and ice ramps to a belay before the ledge runs out. 2. 30m Step down into the wide undercut crack and tin opener tenuously to the arête (cams, bulldog). A foot off tin opener move gains access to the rib on the right (peg). The aid route continues along the crack. Quit the crack and climb leftwards on the tenuous wall above to gain a ledge. Go right beneath a steep groove and move round it’s base to gain a thin crack in an open slab. Climb this to a belay below a chimney. 3. 55m Step up and right from the belay to gain the huge open groove of Don’t Die and follow this with sustained interest to a hanging belay on the right at a large block. 4. 25m Step left and follow the crest, moving left again across a fault to a ledge and good belay at a flake. 5. 20m Mantel the flake and step right to regain the crest which is followed to the snow crest on the apex of the buttress (good spike belay). 6. 60m Climb the easy snow crest to a steepening. 7. 40m Climb snow grooves in the buttress crest to a flat knife edge leading to the plateau. 8. 15m The knife edge leads easily to the plateau. PS: Apologies if you’ve tried to get in touch with me over the past few days. I’ll get through my inbox shortly!!! This time, more thin and useless verglassy ice had choked the tin opener placement, so I opted for foot off yarding on whatever scratchy hooks I could get. Of course, I fell off with a mercifully short plunge into the void below. Next time out I opted for more careful hooking of the ice blobs, I made three moves more progress but the ice was too thin and broke off once again with a more exciting dive into space. The wayward ice blob smacked me in the teeth to add insult to injury. My fitness from Spain allowed one more try and this time I got through the tin opener crux with impressive sketching and a dynamic toe hook to stop a terminal barn door. Wow! Here I am on the headwall at last! I have a goddam chance here MacLeod! No sooner had let that thought enter my head than the block I was torquing on and was holding my crucial runner began to lever off, my axe shooting out and peg dropping out not far behind. A sketchy last second hook saved a whipper, but immediate retreat was necessary. So now the route has yet another crux. I seriously underestimated this thing, its nails and I reckon more airmiles maybe clocked up yet. But If I can get to that ledge someday and into those upper grooves, the Ben will have a mega route! The contrast from climbing in Spin could not have been more striking. In Spain you just turn up fit, and the routes eventually go. On Nevis it seems you can be in the physical and psychological shape of your life, and it still slaps you. The project in question, moving out towards the roof. 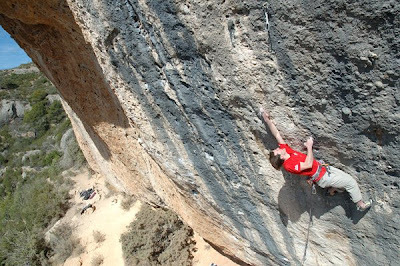 Here is a wee video of a roped ascent of Darwin Dixit 8c in Margalef a couple of days before the solo. Thanks to Michael Tweedley for this. For the video of the solo, you’ll have to wait till we save up for our computer to edit the footage! I just got back from two weeks in Spain climbing at Margalef. Sorry I wasn’t able to blog from there this time. I got some interesting climbs done. I like to keep my level as high as possible in lots of climbing disciplines, and this means doing each of them as often as I can manage. But one I only do very rarely is free-soloing. In fact, I’ve only soloed two routes in the past nine years. I explained why here. 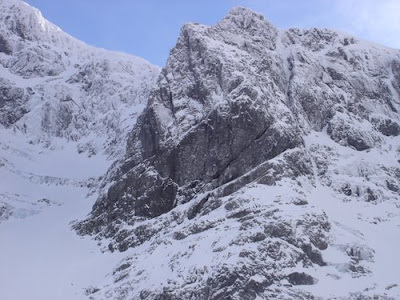 Right now I am preparing for a very special project I am trying on Ben Nevis and I already completed one or two of my training climbs which I saw as benchmarks for a prerequisite physical level. But it’s obviously just as important to spend time doing some psychological skills training for a climb where the seriousness of a fall could not be higher. For this climb I need to be able to climb 8c+/9a in an unprotected position. So I must have great confidence in my ability to make good decisions in a situation close to my physical limit but under a lot of psychological pressure. So I decided to try to make a small increase in my free soloing top level; from 8b to 8c. 8c solo seemed like the right level to test and develop my control. The necessary ingredients were a climb at a high enough level that the moves would be totally committing, and one where the random objective danger of loose rock would not enter the risk equation. 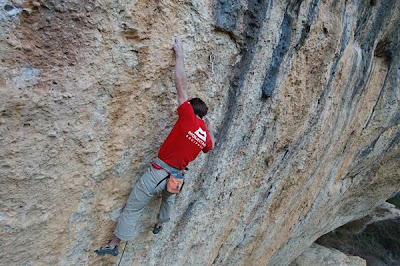 Last spring I did the third ascent of an 8c in Margalef called Darwin Dixit. I remember having one of those amazing days when you just seem to climb a grade harder than normal and everything feels easy. 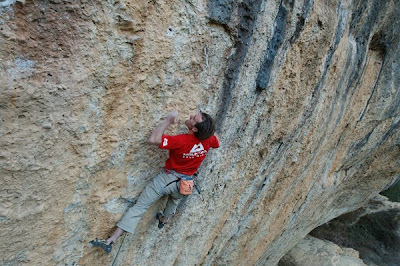 I remember locking off on the crux mono and chalking up on a move that was previously a slap and thinking to myself in the moment – ‘I would be ok soloing here’. That feeling planted a seed that rumbled in my mind throughout 2007 and grew into something significant when I was searching for good training climbs for my Nevis project. On March 4th I soloed the route at 9am. I wrote a diary of my feelings about the preparation and ascent of the climb, which is a bit long for this blog so I’ll probably publish these elsewhere. But I can say that it was a very relaxed and positive few minutes at the crag. Claire filmed the ascent for the film we are making this year and she seemed very relaxed too. I felt utterly focused, and in the classic performance paradox of extreme effort but feeling effortless at the same time. I also felt the large margin of reserve I was looking for. I feel that everyone should be encouraged to find and extend their limits. I agreed and was inspired by Alex Huber when he talked about finding his limits in soloing after his free solo of Kommunist 8b+ a couple of years ago. But anyone should think carefully about why they do something as potentially dangerous as soloing a hard rock climb. Your motivation should always be to extend your own limits in this arena, never to compare against anyone else’s. And you should use your mind to extend this limit by knowing yourself and your ability before you leave the ground, never by letting your ego get you into a situation where you must fight for your life! 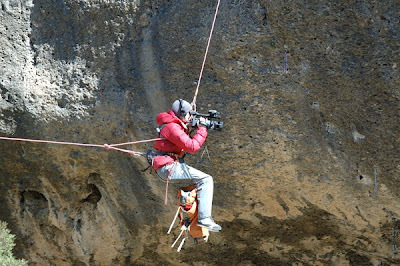 Free soloing must be done perfectly or not at all – you owe this to the people who care about you. But this area of great understanding of one’s own mind and body forms the attraction of soloing. And if you know you have that understanding, then soloing can be rewarding on a deep level. If you ever find yourself at the foot of a solo climb, wondering if you do have that understanding, you almost certainly don’t. Solo climbing is about really knowing, and when you have this feeling it will stand out in your mind so much that you will not have to wonder whether it’s real or not. Can soloing be safe? Yes. Is it always safe? No! Even for the few who can be in complete control of their body and mind on a solo, they cannot be in control of the rock or the weather. That said, soloists awareness and anticipation of these is exceptional because of their experience and huge dedication to their chosen task. Is soloing worth the risk? Sometimes. As I’ve said before, the risks of doing things in life have to weighed up against the risks of not doing things. Balance of risk and reward is for everyone to think hard upon and then take the right path for them. 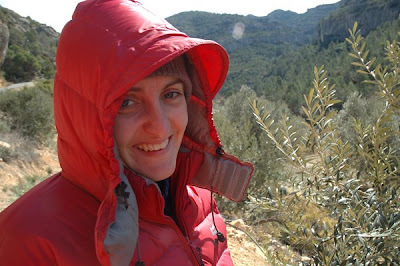 Claire’s pictures of the solo of Darwin Dixit and her thoughts on filming the route are on her blog. PS: After the solo was completed I had a great few days on the cliffs of Margalef and felt reasonably fit with some 8a onsights, my first 8a+ onsight (and almost an 8b arrgh!) and I could consistently climb 8b+ and 8c in a day. So I have made some progress in my training although my body is still a little heavy. Some pics of these below and more on Claire’s blog. Dave Redpath blogged about the trip here. 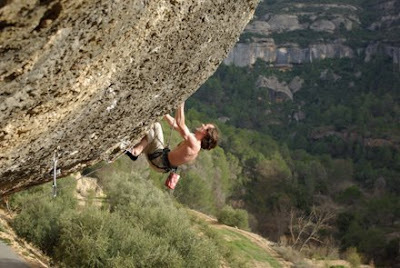 The crux move of a long 8b at Margalef. Is that pocket reachable? Of course! But unfortunately not on my onsight attempt!